To start, I had the kiddos color images of animals that were broken down into very simplistic shapes. We discussed the color wheel and how to make new colors from primary and secondary colors. Then, I showed them Photos of Henri Rousseau's work and how he used vibrant colors and broke nature out into shapes to create jungle scenes as well. This multi-media project was inspired by an email I received from a sweet new friend of mine. Read her blog here! The littles loved how they could relate to his famous work! We drew step by step and they did awesome! These 4's and 5's got it! So many kids this age have only begun to master drawing simple shapes, but today they were able to put those shapes together...some for the first time. They exclaimed, "I can draw a Hippo! I can draw a monkey!!" The kiddos and their parents seemed so pleased at what they accomplished and that gave me such joy!!! We made fluffy clouds with a tape and utilized the white crayon resist technique and they loved the "magic" in that. 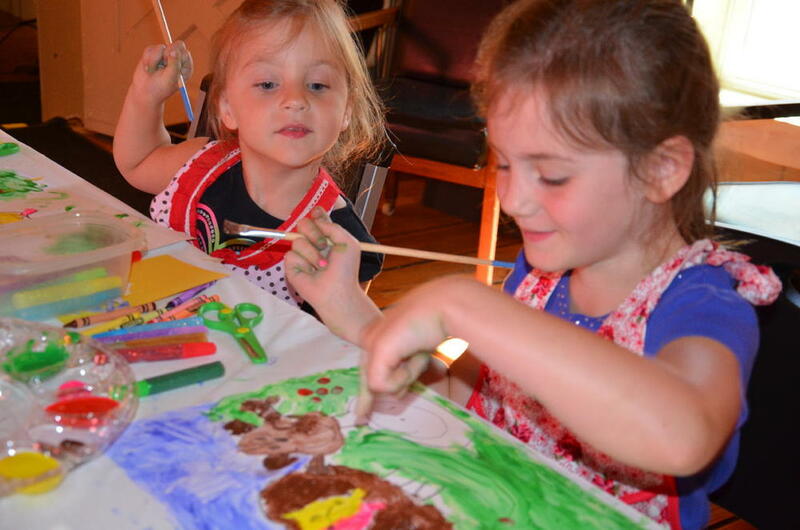 I introduced them to paint brushes after we finger painted to detail their animals. It was so precious to hear the squeals and see them get so excited about painting their monkeys in outrageous pinks and yellows like Rousseau. Then we moved into another media...they ripped construction paper into flowers, trees, a sun and we glued those on. Last, we took glitter glue pens and that was a HUGE hit. We worked on composition, the color wheel, shapes, foreground, background and use of color. They did awesome! Check out these remarkable drawings/paintings our 4's and 5's created!! !